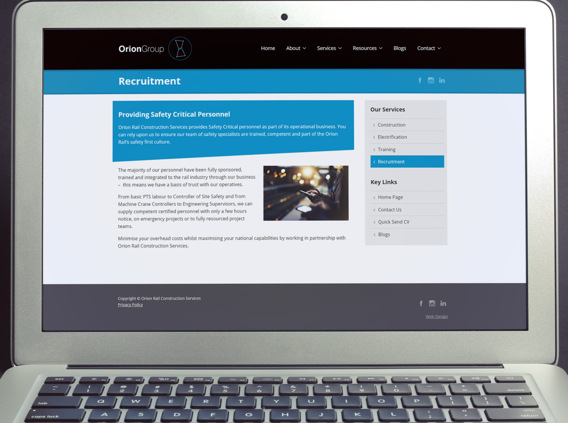 Primary Image created this web design for the Orion Group, who are a worldwide recruitment business, with offices in over 25 countries. They cover a variety of sectors, including oil and gas, power and utilities, finance, IT and the railways. 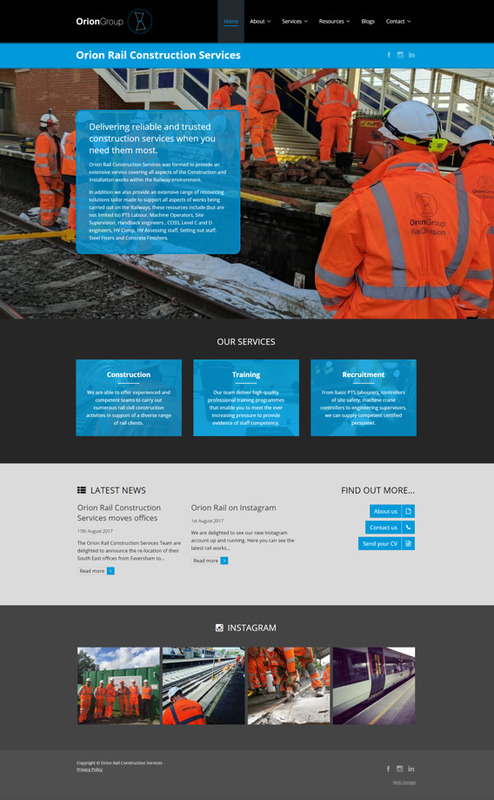 This was the second web design we’ve created for the Orion Group, having previously worked on an earlier site for Orion Rail. This business unit specifically offers rail construction services, as well as staff training and resourcing services. The company’s clients include Network Rail, London Underground and Crossrail. The client wanted a web design that had a similar style to their other group websites. As this business unit (and an existing website) had been acquired by the group, the existing website wasn’t fit for purpose. They needed a new website that would use the group’s own branding, and were keen to have a straightforward, uncomplicated layout, suitable for the company’s expanded services. They also wanted to have a large full-screen “hero” image on the home page. An initial web design was ready within a week of the project starting, so changes could be previewed in-situ. We developed a style appropriate to an engineering business, using a mixture of black, grey and blue shades, which were taken from the company’s branding guidelines. 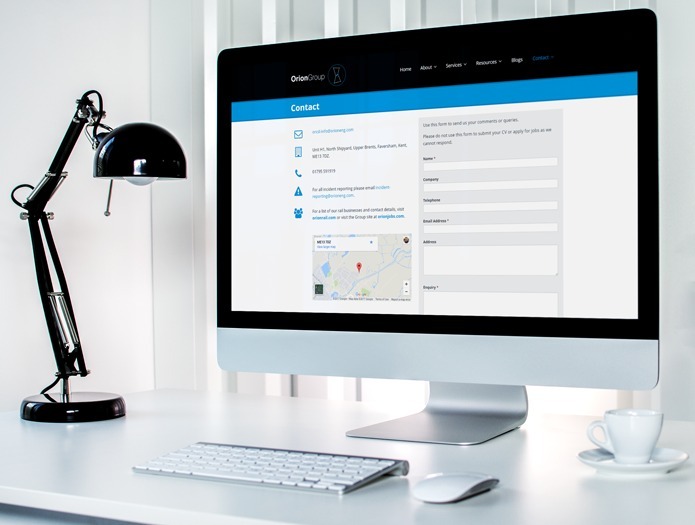 Whilst some content was retained from the previous website (which we replaced), the home page was significantly improved, so it leads visitors into the website better through clearer pathways. The new home page is also a lot cleaner, using less wording, compared to the older website. The new website works much better on mobiles too. A new blog / news area was added for the company’s announcements. News items are automatically listed on the home page for ease of access. The home page incorporates a live Instagram feed, which can be updated via the Instragram smartphone app. This helps showcase examples of the company’s work. We also added social media links in the website’s header and footer, so visitors can follow and connect with Orion Rail. In addition, we developed a CV upload function. This allows visitors to fill out a short form and easily upload their CV by dragging and dropping a file into the webpage. For security, the form only allows Word and PDF files to be submitted. CVs get sent directly to Orion Group. At the same time, it was important we hardened the security on the website, such as installing a secure encrypted (HTTPS) connection. Primary Image has extensive experience of working with rail sector clients. See our dedicated area for more info.